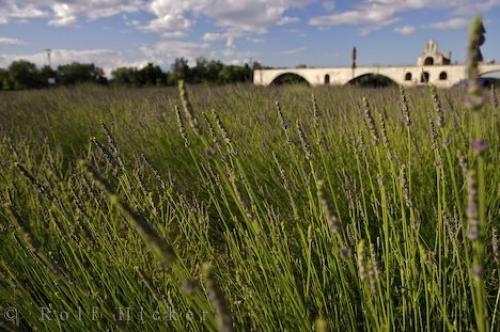 The Saint Benezet Bridge on the Rhone River in Avignon, Provence in France has an aromatic lavender field making up the landscape in the forefront. Although there are only four arches left on the Saint Benezet bridge which crossed the Rhone river at Avignon, Provence, it still houses the little Chapelle St. Nicolas. The 12th century bridge is better known as the Pont d'Avignon of the famous song 'Sur le pont d'Avignon..." The landscape made up of lavender borders the Rhone and the bridge adds to the beauty of the scene.Lavender field backdropped by the Pont St Benezet and the Chapelle St Nicolas by the Rhone River, Avignon, Vaucluse, Provence, France, Europe. Photo of the landscape full of lavender which surrounds the Saint Benezet Bridge in Avignon, Provence in France, Europe.